🎂🍾🥂🎸🥁🎤 One year ago today we release our very first single, Challenge. What an amazing year it’s been - thank you all for the incredible support! Now we absolutely cannot wait to hit the road next month celebrate our debut album live across Europe with you all..
We can't wait to hit the road with the incredible Delain next month! And it seems like you can't wait either - London, Utrecht and Bochum are SOLD OUT! Get your tickets for the remaining shows in time! We can't wait to see you there! Special thanks go out to Pro Helvetia Moscow for making these shows possible. 🎸🥁🎤JUST ANNOUNCED: CELLAR DARLING - FOR THE FIRST TIME IN 🇷🇺RUSSIA🇷🇺 || ВПЕРВЫЕ В РОССИИ! We said we'd try our very best to visit every single one of you, and here's the next bunch of tour dates. We can't wait for the 'Female Metal Voices Fest' 2017 with the amazing The Agonist and Sirenia! New Tour Dates with Lacuna Coil! 'This Is The Sound' has been out for a month, and we're at a complete lack of words. We're incredibly thankful for glowing reviews, for video views and comments beyond our wildest hopes, for amazing first festival shows, and most importantly, for the deluge of awesome feedback from the best fans in the world. Now we have one priority, and one priority only: getting back on the road, and making it our mission to visit each and every one of our fans to celebrate our music live together. We're already excited about hitting the road with Delain in the fall, after premiering our club show with two dates in Switzerland, and are proud and happy to announce that we've added another 27 shows with none other than the incredible, amazing Lacuna Coil! THIS IS IT - THIS IS THE SOUND. Today’s the day! Almost exactly one year after Cellar Darling came into existence, we couldn’t be more proud to present to you our debut album, ‘This Is The Sound’. It is available now at the digital service, download store, online store and of course physical record store of your choice! HEADLINE SHOWS IN SOLOTHURN & ZURICH ANNOUNCED! It is time to announce the first club shows with our new album. We are looking forward to rocking out with you at the Kofmehl & Dynamo clubs! We are happy to announce that Cellar Darling will be playing a FREE show at this year's edition of the legendary Montreux Jazz Festival! 'Avalanche' Single & Video Released! We’re proud and happy to present to you the next single and video from our upcoming album ‘This Is The Sound’: Avalanche! Shot in the heat of beautiful Tenerife, an intentionally contradictory setting, this video tells you our story with symbolism and movement, contrasts & metaphors. So sit back and let your imagination run wild - enjoy! Once again we’d like to thank everyone involved for their hard work: the talented actress Fabienne Fellmann and of course AVA Studios GmbH and their awesome team! …and of course in the many other stores & the digital services of your choice! Options for physical pre-orders include both CD and double vinyl versions, and a very special limited digibook is also available. It features 3 bonus tracks! We each chose a cover song to interpret in CELLAR DARLING’s own, unique style. Anna picked 'The Cold Song’ from Henry Purcell’s “King Arthur” opera, Tears for Fears’ 'Mad World’, was chosen by Ivo, and the epic Queen classic 'The Prophet’s Song’ is one of Merlin’s all time favourites. Also included in the digibook will be an alternative and limited cover artwork plus an extended 32-page booklet, filled with the our notes on the stories behind the songs. Switzerland! We are looking forward to finally playing the legendary Z7 as Cellar Darling - joining Evanescence for their performance at this year's Summer Nights Open Air, one week after the release of our debut album 'This Is The Sound'! Pratteln! Wir freuen uns sehr, endlich eine Show im legendären Z7 bestätigen zu dürfen - zusammen mit Evanescence am diesjährigen Summer Nights Open Air, eine Woche nach der Veröffentlichung unseres ersten Albums 'This Is The Sound'! OUR BRAND NEW SINGLE 'BLACK MOON' IS OUT NOW! We’re proud and happy to present to you the first single and video from our upcoming album ‘This Is The Sound’: Black Moon! Black Moon' is one of the first songs we wrote after our debut single last year, and probably the point where we definitely "found" our sound. Ivo randomly called his original demo 'Moon' and that triggered the idea of a story based on the fear of a black moon... So, as a lyrical theme, we ended up exploring mankind's tendency to add an apocalyptic interpretation to the lunar eclipse. We'd like to thank everyone involved for their hard work in the scorching hot 'lunar landscape' of Tenerife: he talented Fabienne Fellmann and her fellow actors as well as AVA Studios and their awesome team! We’ve also launched the pre-order for the album and you can get the single now on any digital platform of your choice! While we're at it, check out the full tracklist of the album - 14 original songs amounting to a full hour of music. As if that’s not enough, the mediabook edition will feature 3 bonus tracks! Each of us three chose a cover song to interpret in our own style: 'The Cold Song’ from Henry Purcell’s “King Arthur” opera, chosen by Anna, Tears for Fears’ 'Mad World’, chosen by Ivo and the epic Queen classic 'The Prophet’s Song’ - One of Merlin's all-time favourites. Also included in the mediabook will be an alternative and limited cover artwork plus an extended 32-page booklet, filled with the our notes on the stories behind our songs. Right now we're on the road for a series of exclusive pre-release shows - it's not too late to catch us in Slovenia today, Italy tomorrow and Munich, Germany on Sunday! Our first album, entitled ‘This Is The Sound’, will be released through Nuclear Blast records on June 30th, 2017. This is it: this is the result of nearly one year of incredibly intense creativity, of ups and downs, of loss and gain. In less than a year we’ve formed a new band, written an album, and defined our sound. This is the most personal work of our lives: This Is The Sound. After perhaps the most intense and creative year of our lives, our album is finally complete. It is scheduled for release on Nuclear Blast records this summer, and with that settled we've got only one priority in mind: to get back on stage, as soon and as often as possible, and celebrate our new songs live with you all. Needless to say, we're stoked to have been invited to join the incredible Delain on their very special Danse Macabre Tour, featuring Nightwish's Marco Hietala! We're completing the lineup along with Austria's Serenity. Every single one of these carefully selected shows in France, Switzerland, Germany, Holland and England is bound to deliver a night to remember - do not miss the one near you! We've spent past couple of weeks in a shared home by the beautiful lake Lucerne writing new songs. Now we're back in the studio turning our new ideas into reality. We are proud to announce that we have signed with Nuclear Blast records! We are extremely happy to be “back home” after so many years as part of the Nuclear Blast family. They have shown continuing faith in us through difficult times, and we knew they needed to be among the first to hear our new music - and as it should be, everything else quickly fell into place. We are excited to have found partners who understand our music and share our vision; together, we will make this year our year! We are currently working on our debut album, to be released in 2017. More news will follow soon, stay up date to here or follow us on our official channels! We've ended our year with a new beginning: our very first shows are history! We cannot thank you all enough for showing up and supporting us in Zurich and Amsterdam - we've had an incredible time, and we cannot wait to return to the stage next year. In the meantime, however, we are focusing on writing new material: our first album will be recorded starting in January, 2017! We wish you all wonderful holidays and we are looking forward to one awesome year together with all of you. On the 4th of December, we will celebrate a world premiere with very first live show, ever! We are joining the one and only Amorphis for their “Eclipse” 10th Anniversary Show at the Komplext 457 in Zurich! And if you don’t yet have the tickets for our show in Amsterdam, just two weeks later, get them while you can. 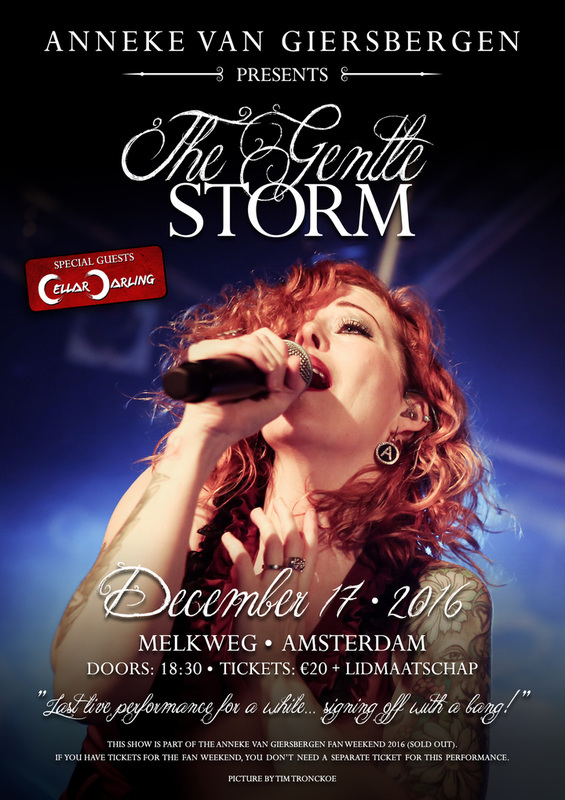 We'll be sharing the stage with the incredible Anneke Van Giersbergen’s ‘The Gentle Storm’! This one’s nearly sold out! Stay tuned for further updates - we are not yet done! 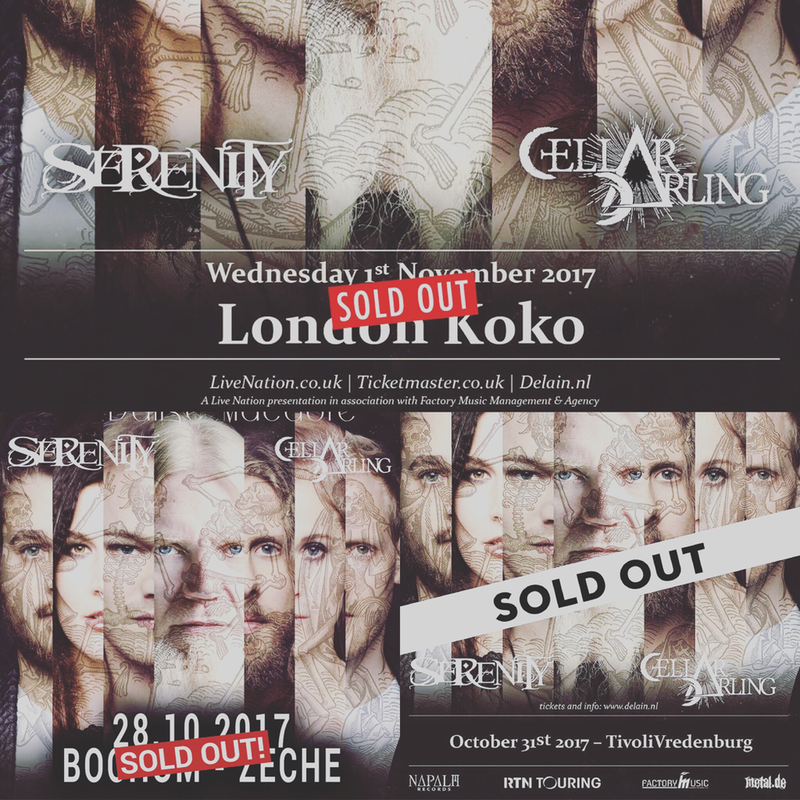 Our show with Anneke Van Giersbergen's The Gentle Storm is nearly sold out - two months in advance! Get your tickets while you can! First Single Released: Challenge is Out Now! #Challenge is here. We are incredibly excited to share the very first Cellar Darling song with you! Along with ‘Challenge’, we have also released another song from the same writing and recording sessions: ‘Fire, Wind & Earth’ is a bonus track we couldn’t keep from you any longer! ‘Challenge’ is about an inner struggle, a battle you are fighting against yourself and the world. It is you, screaming at yourself in the mirror and getting high on new-found strength. It is failing, overcoming and achieving. The bipolar dance that is life. We have fallen. We have screamed. We have battled. We found strength. We will overcome. Both songs are available for streaming and downloading at Spotify, iTunes, Apple Music, Deezer, and all your favorite platforms and services. The lyric video features the talent of actress Fabienne Fellmann (who is also featured on the cover artwork). It is based on an idea by Anna Murphy, directed by Anna Murphy & Cellar Darling, with videography and editing by Merlin Sutter and generous post-production help by Michel Frutig at Maybaum Film. Both songs were recorded and produced by Cellar Darling and Marco Jencarelli & Anna Murphy at Soundfarm, mixed by Tommy Vetterli at New Sound Studio, and mastered by Jens Bogren at Fascination Street Studios. All strings are recorded by the one and only Shir-Ran Yinon, and the artwork features photography by Merlin Sutter.